Thank you to the organisers of March in March for inviting me to speak today. If you’re wondering who I am, I’m one of you. I’m not a politician. I’m not a journalist. I’m not a lobbyist. I’m not a mining magnate. I don’t own a newspaper. I’m not an ‘insider’. But perhaps that is a benefit. Because it’s often the people on the outside who can see best what is happening inside. And right now, all I can see in our country’s recent past is the wreckage strewn in the wake of the Tony Abbott wrecking ball. And all I can see ahead is a whole lot more trouble for the country that we all love. So today I would like to share with you my ideas about the lessons our community need to learn to protect ourselves from this type of government in the future. This is partly a manifesto to inspire a One Term Tony scenario. But it’s also more long term than that. It’s about making sure that we don’t just react and defend against right wing ideologues and their vested interests. It’s about laying the foundations for a progressive ideas platform that will erase the very reasoning behind people’s terrible decision to vote for right wing ideologues like Tony Abbott. So what’s this manifesto’s central theme? Quoting a musician I greatly admire, Gurrumul: united we stand, divided we fall. Together we’ll stand, in solidarity. That’s the crux of it. We’re all in this together. And I think all of us here know that. We might all have our individual outrages about the Abbott government. But what binds this passion together, what binds our values together is the understanding that Abbott is not just bad for all of us, as individuals, though he certainly is that. No, why we’re really here is because we know he’s bad for our community. And our community is us. We know we’re in this life together. We know the life of Reza Berati is no less important than our next door neighbour, or one of our own family. We know when any Australian loses their home, or their life from a natural disaster, we all mourn. We know that when someone at Holden loses his or her job, it damages all of us. We know that if someone we’ve never met doesn’t get the education opportunities they deserve, we all suffer. We know that when we go to work each day, or when we stay home caring for a family member, and wherever we are all over South Australia and Australia, we are building something together. That’s what makes us, us. Now, I know what you’re thinking. You’re thinking that even with all of us, Abbott still won the election in September. And you’re right, this is a problem. But that’s why we need to turn our attention to those who voted for Abbott. Those who have forgotten that when we say ‘us’, we mean ‘them’ as well. 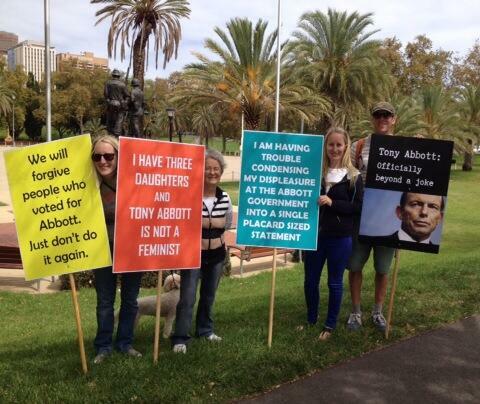 If there’s one thing Abbott is good at, like a person who punches holes in walls, it is frightening people. And when people are scared they turn inward. When they’re scared of the monsters Peta Credlin created, they turn inward. Non-existent monsters like the great. big. tax, mining companies shedding jobs, regulations, in other words, worker’s rights, which apparently ‘strangle’ enterprise and ‘corrupt’ unions. All complete nonsense. But voters believed it. Australia turned inward when the majority of us voted for Tony Abbott. We rejected kind and compassionate when we chose to stop. the. boats. We rejected common sense when we decided the money spent saving our economy, our livelihoods from the Global Financial Crisis, was wasteful. And we rejected science when we put our fear of an increase in electricity prices ahead of our determination to slow climate change. 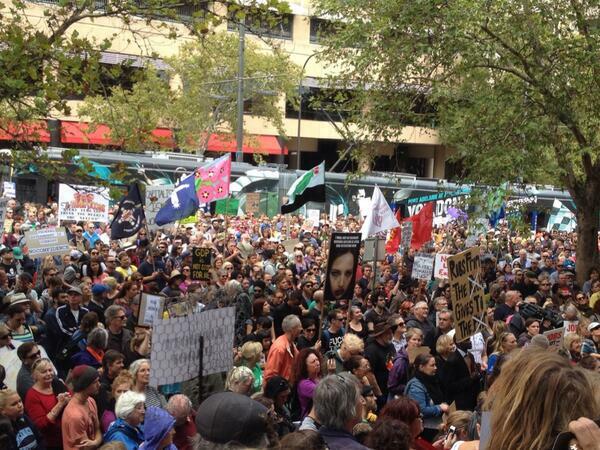 Abbott promised these scared, threatened and oh so gullible people that he would fix everything. That it was a good idea to be selfish and mean and greedy. To forget that they lived in a community. Dog eat dog is back in vogue. So we need to fix this. We need to show people that when they turn their backs on their communities, they lose out, every time. We need to remind people that unemployment in industries they don’t work in is bad for them as well. Since they care so much about their electricity bills, let’s run with that and remind them how much climate change will cost our community, in money terms. This community is made up of individual thems. Let’s show people that wealth doesn’t trickle down. Let’s prove to Australians that a richer Gina Rinehart makes nobody else richer. Except perhaps Gina’s still in the will daughter who definitely won’t be giving any of her inheritance away. Abbott might believe that Holden workers are on their own now that their jobs are gone. But they’re not on their own, because they belong to our community. No one should ever be told they’re on their own, in the bad times, or the good times. That is why we need to remind people, in the words of US Senator Elizabeth Warren that no one in this country gets rich on their own. And then we need to remind them that the country’s wealth is something they can enjoy and something they can share, but only if they make the smart decision to support their communities, which in turn supports them. The path to prosperity for the nation and the path to healthy communities is not individual success. It’s success for all of us. It’s really that simple. Once you understand this, once you use this idea to frame how you see the world, suddenly Abbott looks like a horrible option. Suddenly progressive policies aren’t scary, because they represent the common good. We should be helping our fellow Australians up the ladder of social mobility. Not kicking it down and burning it as Abbott is doing now. A stronger you makes our team stronger. And our team is all of us. We’re all part of the same team. Thank you all for standing here with me today and for standing up for your community. Let’s go forth and spread the word. Let’s remind people who have forgotten this basic idea. United we stand. Divided we fall. Together we’ll stand, in solidarity. Victoria, congratulations in articulating so well the feelings of so many of us here in Oz. I personally could not agree with you more! Well done! Absolutely terrific Victorian. It was fantastic to listen and follow your speech and it was fantastic. Go for it Vic sock it to them. Reblogged this on In my own opinion. Victoria, they didn’t even show it on the ABC 7 o’clock news here in WA. SBS and the ABC had it on and I think it was 7 here in Victoria although you didn’t appear Vic. I think I have a girl crush on Victoria. I love the way she thinks and expresses herself so clearly. You forget or ignore the utter incompetence of the government that we have just replaced, until Labor and its fellow travellers learn to both adequately plan and then properly administer the machine of government they will remain, thankfully, unelectable. Like always Mr Hall you are not worth the space in time.